Pakoras are basically spiced Indian batter-fried vegetables. My kids will eat ANY vegetable dipped in Pakora batter! Pakora batter is so-o-o simple, just besan, or chickpea (gabanzo) flour and spices. But because I can't leave well-enough alone, to that basic recipe I added a Southwest sort of twist; a little cornmeal for added crunch, and then used the batter to coat corn kernels and smoky-hot fire-roasted green chiles. I kept the Indian spices though, I think they go pretty well with the chiles and corn... Yum! 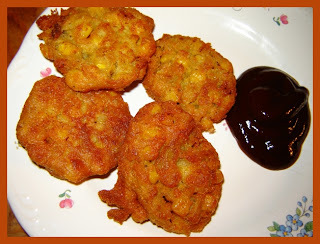 Since you can't exactly dip individual pieces of corn into the batter like you would larger vegetables for traditional pakoras, these end up rather like spicy, crunchy corn fritters.... only better. I included traditional Tamarind Chutney for dipping because I already knew how to make that, but salsa or green chile sauce would work well here too. Heat 1 inch oil in small frypan. Mix all other ingredients. Add more chickpea flour as needed to make a stiff pancake-like batter. Drop by spoonfulls into hot oil. Fry until brown, turn with tongs. Fry other side. Drain on paper towels. Serve with Tamarind Chutney or whatever you like for dipping. Gently mash tamarind with water in a small bowl until pulp is soft and squishy. Push pulp through a sieve into a medium pan. Press on it with the back of a spoon and tossing out the thick fibers. Add sugar and cook over low heat, stirring, just until sugar is dissolved. Toast spices (except ginger) in a small skillet over moderate heat, stirring, until fragrant and a shade darker, about 1 - 2 minutes. Cool completely. Stir spices into tamarind mixture along with chile powder, ginger and salt. Blend with food processor or immersion blender until smooth, serve with Indian pakoras. I'm drooling over those pakoras, I really need to go pick up some besan so I can try that out.